Tips for Selecting a Safe Nursing Home for Loved Ones | Hupy and Abraham, S.C. When the time comes that a loved one can no longer be cared for in their home, the difficult decision of whether it’s time to enter an assisted living residence or nursing home becomes a reality. The intent is to find a place that allows your loved one to live with dignity while receiving the care they need. But this selection process should be a careful one, and there are many things to consider. The attorneys at Hupy and Abraham hope that these tips will help you in selecting a safe nursing home that meets the individual needs of your loved one. Remember residents have rights. In assisted living facilities, there are regulations regarding life in the facility. But as clients (regardless of being on private medical coverage or Medicaid), residents have rights such as retaining their clothes and belongings, having a say in their personal daily schedule, seeing visitors, keeping their privacy, residing in a homelike environment, and choosing their own physician. A proper facility should feel like a home where residents are treated respectfully. Check it out. Nursing homes should maintain a particular standard of care at all times. How clean does is seem to be, what is the food like, and does it seem safe/secure? Caring for elderly residents requires that staff goes above what would be required for the average adult patient. Accidents need to be cleaned up immediately, food for ill and aging individuals needs to be substantial as well as pleasing, and there should be ample ramps, grab bars and staff available to assist residents in getting around. A visit before move-in is essential. Note activity. Activity is crucial. Unless a resident is bedridden, it is very important that a social environment is provided. Look at the facilities’ daily events and activities. Look to see how often residents interact, or how much time they seem to spend outside of their rooms. If the majority of residents appear isolated in their rooms, or tuned into a TV, it’s not a good sign. Talk with the staff members and watch how they interact with residents as well as fellow staff members. Often neglect or abuse occurs in homes where the staff is overworked and/or understaffed. You want a facility were the staff makes an effort to spend time with residents and treats them with the respect of learning their personal schedule or situation. Staff that spends most of its time at the front office (talking, gossiping, etc.) between rounds, rather than chatting with and checking on residents, will likely provide subpar care. Get advice, as well as feedback. 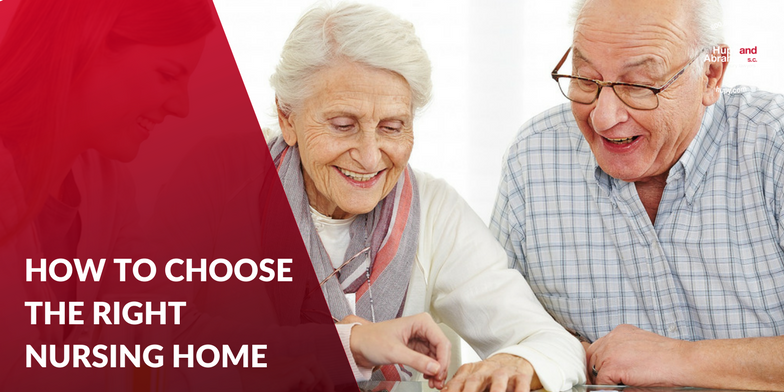 At some point, someone you know will have had some experience selecting a nursing home, whether it was for a parent or another loved one. They likely have some insight that could be helpful. Ask a facility’s residents and their families for their honest opinions about the community, and check for reviews online. Most nursing homes will have some online resource where people can share their experiences and rate the facility. One of the many reasons people decide that a nursing home is the best place for their loved one, rather than in their own homes, is for the degree of safety and care that is difficult to provide at home. Cases of nursing home abuse and neglect are completely preventable, and the lawyers of Hupy and Abraham believe that everyone should be treated with dignity, and hope you find a nursing home that meets your needs. If your loved one has been hurt by the negligent or abusive actions of a nursing home or its staff, please contact the experienced attorneys of Hupy and Abraham at 1-800-800-5678 to schedule a free consultation. ?Can restraints be used in Iowa nursing homes? ?How long do I have to file a nursing home abuse case in Iowa? ?Do I have the right to bring a lawsuit alleging nursing home abuse or negligence in Iowa?